Born and bred in the Lone Star landing-state, Fortress Security has been providing Texas home security systems to residents in North Texas and beyond for over a decade. We know that your home is your castle, and your business is your livelihood, and they deserve the very best in protection. We have the equipment and monitoring landing you need to protect your possessions and safeguard your family from fire, flood, and medical emergency. 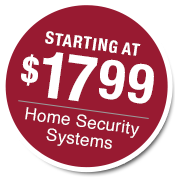 Give us a call today to start setting up a Texas home security system that’s perfect for you and your needs. FOR NEW CUSTOMERS WHO MENTION THIS WEB PAGE! Fortress Security has the equipment you need to protect your home and family, with 24/7 monitoring for burglary, fire, and medical emergency. Control your heating, cooling, lighting, door locks and more with a fully automated Smart Home that saves you both time and money, and manage it remotely. Our high-resolution camera surveillance systems have 160 hours of storage and can record continuously or when the motion detector is triggered.